This news was initially reported by Patriot News Radio, which you can listen to in this video clip. While the information is true and current as displayed on the U.S. mint page here, it is not anything new. The Mint has not sold uncirculated American Eagle silver coins directly on their site for two years, but has continued minting “bullion coins” that are distributed to dealers. I called the U.S. Mint and they confirmed that they did not produce American Eagle Silver Uncirculated coins in the past two years and thus far in 2011 have no plans to re-start production. They also clarified that they are still producing proof Silver Eagle coins, but they have numismatic value and carry a much higher premium. While the hype and rumors are misleading, I think the takeaway is still the same – physical buying is overwhelming supply. Strong demand for Silver Eagles pushed sales to an all-time record of 6.4 million ounces during the month of January. This number is 50% higher than any prior month in the U.S. Mint’s 26 years of published sales history. The latest data also shows that February sales set another all-time record for that particular month and the 7th highest monthly sales ever. But the truly significant point, as discussed in the last edition of the Gold Stock Bull newsletter, is that those 6.4 million coins represent nearly 20% of total domestic mine supply. The US mines only about 40 million ounces a year. If sales continue at this pace, 100% of all silver mined will be exhausted by Summer on just this one product, which typically represents only 5% of total silver usage. 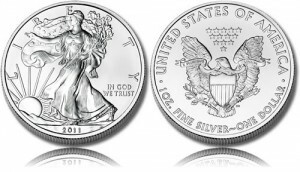 Although the demand for precious metal coins remains high, the increase in supply of planchets—coupled with a lower demand for bullion orders in August and September—allowed the United States Mint to meet public demand and shift some capacity to produce numismatic versions of the American Eagle One Ounce Silver Proof Coin. However, because of the continued demand for American Eagle Silver Bullion Coins, 2010-dated American Eagle Silver Uncirculated Coins will not be produced. The United States Mint will resume production of American Eagle Silver Uncirculated Coins once sufficient inventories of silver bullion blanks can be acquired to meet market demand for all three American Eagle Silver Coin products. Continued shortages are likely to send premiums on Silver Eagles soaring, particularly if the Mint has to stop production at some point. Despite silver breaking out to 31-year highs, it still has much further to go. It has yet to reach its nominal high around $50 or inflation-adjusted high around $150. If you haven’t secured physical silver in your possession, you might want to get on it while you still can. Jason Hamlin is the founder of Gold Stock Bull and publishes a monthly contrarian newsletter that contains in-depth research into the markets with a focus on finding undervalued gold and silver mining companies. The Premium Membership includes the newsletter, real-time access to the model portfolio and email trade alerts whenever Jason is buying or selling. You can try it for just $35/month by clicking here. All ideas, opinions, and/or forecasts, expressed or implied herein, are for informational purposes only and should not be construed as a recommendation to invest, trade, and/or speculate in the markets. Any investments, trades, and/or speculations made in light of the ideas, opinions, and/or forecasts, expressed or implied herein, are committed at your own risk, financial or otherwise. The information on this site has been prepared without regard to any particular investor’s investment objectives, financial situation, and needs. Accordingly, investors should not act on any information on this site without obtaining specific advice from their financial advisor. Past performance is no guarantee of future results.